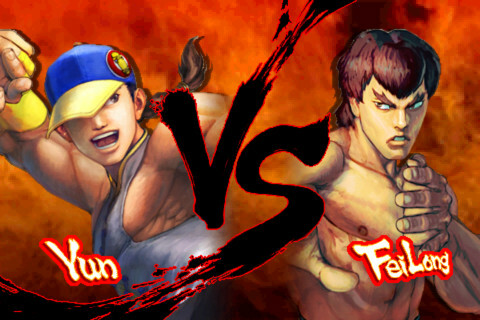 The iPhone app version of Street Fighter IV Volt is worth its title. Street Fighter has been an awesome franchise for years, and this latest release is as fun on an iPhone, iPad , or iPod touch as it is at the arcade. Although there are a few issues with controlling, everything else about the game is spot on. Anyone familiar with Street Fighter will understand the central concept. 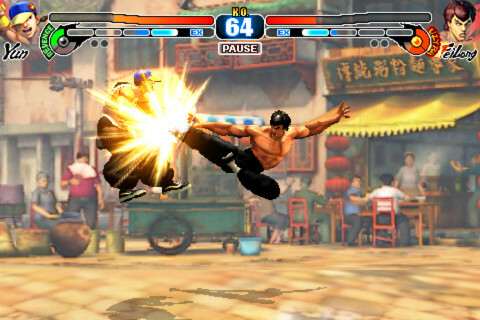 A player chooses between 22 fighters – which is more than there are in any other SF application – and fights against a computer controlled opponent in a variety of stages. All the best characters are there, like M. Bison, Chun Li, and Ken, with newcomers such as Yun and Fei Long rounding out the cast. Each character has their own specific special moves that do extra damage, and can be used at certain opportunities. Unlike old Street Fighter releases, Volt makes it much simpler to use these special moves. Instead of inputing difficult combos on the control pad, the player just presses their health meter to unleash destruction. This feature can be turned off if one prefers an old-school feel. The graphics on Street Fighter Volt look great, and really use iPhone’s computing power to its advantage. The mixture of 2D and 3D effects is amazing – although it may not look as good as it does on consoles, it still makes for an involving thrill. The sounds and music are good, nothing special, but they do manage to keep that Street Fighter feel. The game itself has several different play modes. The training dojo really goes in to all the different hits and combos one can pull off with practice, and the tournament mode presents a new challenge. The difficult can be toggled from 5 different ratings, so it’s fun for novices and professionals alike. The most interesting aspect is the multiplayer. The systems can be linked through bluetooth or wi-fi for battles between players. While the wi-fi works very well, the bluetooth can be somewhat slow at times, which puts a damper on battles. Still, Street Fighter was meant to be played against a real opponent. Having this feature is absolutely essential, and it’s good that they put it in. At time of writing Street Fighter Volt is only 99 cents in the app store. Even at full retail price, this app is a treasure. There is simply a dearth of good fighters in Apple’s app store, and many of the decent ones are made by unknown companies. The minute that Capcom banner flashes across the screen, gamers know they are in for a treat. This newest release can easily stand up to Street Fighter 2 as one of the best in the series. Updates: Street Fighter on iOS has added Battle Network, along with Sharing Replay Data. With Battle Network you can now join your friends in your own teams and battle agains other teams to increase your ranking. The new update has also added 5 new characters to bring the total of fighters to 22. The 5 new characters in the game are Balrog, M. Bison, Cody, Sakura, Feilong, and Yun. AppSafari review of STREET FIGHTER IV VOLT was written by Darius Reimm on November 15th, 2011 and categorized under Action, App Store, Arcade, Featured, Fighter, Games. Page viewed 5137 times, 1 so far today. Need help on using these apps? Please read the Help Page.